AUGUSTA, Maine — The LePage administration has decided to take a pass on applying for its share of federal conservation funds. Over the past 25 years, Maine has tapped federal funds under the Forest Legacy program, which has infused more than $75 million into Maine conservation projects, protecting more than 750,000 acres from development. Critics of the administration say this yet another blow for land conservation in Maine. Last fall, Wolfe Tone of the Trust for Public Land was involved in a Forest Legacy proposal for submission to the U.S. Department of Agriculture. The expectation was that the LePage administration would approve the major conservation project, in western Maine, and seek a nomination to the federal program. Then, right after Thanksgiving, Tone heard that the governor had refused to support the project. “That was our surprise moment that said, OK, the sands are shifting,” Tone says. Since then, Gov. Paul LePage has refused to release more than $6 million in conservation bonds for the Land For Maine’s Future program until lawmakers agree to support his plan for increased timber harvesting on public lands. 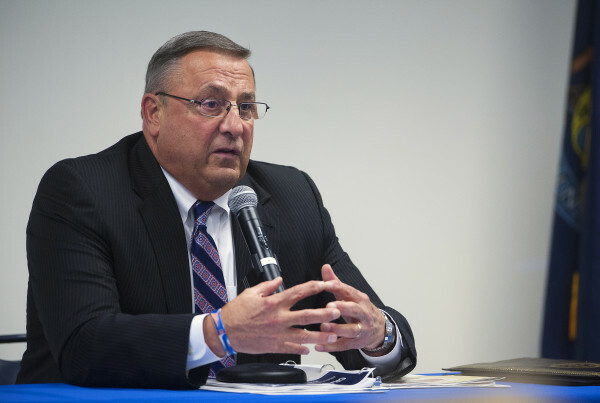 LePage wants to use those proceeds for energy assistance programs. Meanwhile, the LMF program, which used to provide the state match for the Forest Legacy applications, continues to wither, prompting some conservationists to speculate that there is a direct link between the governor’s position on the bonds and his decision to sit out this year’s round of applications to the Legacy program. Tone says large landowners who are weighing conservation options have just had a valuable funding component taken off the table. Protection of large tracts of timberland against development is not the only role of the federal funding, says David Trahan, executive director of the Sportsman’s Alliance of Maine. He says hunters and fishermen rely on the program to provide land that can be accessed to enjoy the Maine outdoors. Trahan says the governor’s decision not to participate in the Legacy program this year — the first time in 15 years — is serious setback for all Mainers. “That’s probably the saddest component of the governor’s actions, is that he’s now ensured that average Maine people will not have access to land in the future,” Trahan says. Alan Stearns, executive director of the Royal River Conservation Trust, used to oversee the Forest Legacy program for the Maine Bureau of Parks and Lands. He says it’s ironic that the state’s decision to forgo federal conservation funding coincides with the announcement of Weyerhaeuser Co.’s $8.4 billion buyout of Plum Creek, which owns 861,000 acres in Maine. “The land ownership patterns in Maine continue to change and continue to change rapidly, and again the LePage administration has chosen not to pursue federal money for a tool in their toolkit to welcome Weyerhaeuser to Maine and say that they we want to proactively be at the table to chart the future of any relationship with any landowner,” Stearns says. In a written statement, John Bott, a spokesman for the Maine Department of Agriculture, Conservation and Forestry, says that while the state is not requesting Forest Legacy funding in the next fiscal year, it is moving ahead with three Legacy project applications that were already approved for submission to the feds. Bott says that there is no connection between the administration’s position on LMF bonds and the Legacy funds. This article appears through a media partnership with Maine Public Broadcasting Network.